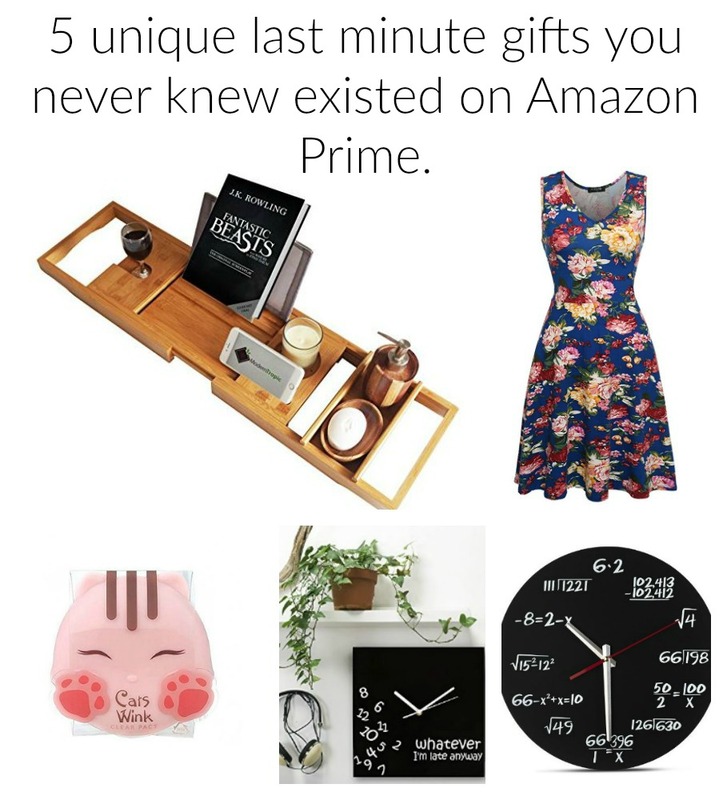 Beautiful Incentives: 5 Unique last minute Christmas gifts that you never knew existed on Amazon Prime. 5 Unique last minute Christmas gifts that you never knew existed on Amazon Prime. The time has come for the crazy rush of last minute gift buying and I'm pretty sure everyone and their mom's dog walker are frantically looking all over Amazon Prime for the perfect gift or those finishing touches. With prime, things get to you in lightening speed and it's so worth the price. More and more companies keep coming out of the woodwork to offer the most affordable unique merchandise. Here are my top 5 unique Amazon prime picks for Christmas. Clocks have always been something I love and there's no shortage of nifty ones on Amazon. I have a Dali Melting Clock I got on there years ago. Any mathemagician beau or friend in your life would appreciate this Decodyne Math Clock they will proudly display their nerdy side with. Or what about an ode to those fashionably late all the time? The Decodyne Whatever Wall Clock is perfect for those with a great sense of humor, but not time. Don't forget the makeup enthusiast. The Tony Moly line is my absolute favorite unique line of Asian Beauty. Their packaging is so cute and far different from your average products. It just adds a fun vibe to your vanity. I have the Pocket Bunny Mist and it smells and feels divine. We all know someone obsessed with fashion, but always complaining how they can't afford it or they just don't trust the cheaper places. Well, it's harder for plus size gals. In recent years, the fashion side of amazon has blown up, size wise too. I have several ACEVOG Floral Dresses and I can vouch that what I paid was every bit worth it for the quality and prints. Proof that you don't always have to skimp on quality! You just have to know where to look. The prints are very unique and feminine and comparable with designs like Lilly Pulitzer. Oh, by the by, they go up to a TRUE size 2x and come in sleeved and sleeveless! They aren't just for plus size gals either! Know someone who loves to take bubble bath's, lives for their spa day get away? Then this all in one Bamboo Bath Rack and Caddy would probably make them squee with delight. I own one and that's me chillax'n in the pic below, with my favorite necessities. It holds everything and is very sturdy! I sit there with my book and cell phone and enjoy the much needed relaxation. There are so many affordable unique gifts on amazon that people take for granted. Search high and low for those prime gems. All these products I have purchased on my own and they all came within two days of ordering. You can expect to get them in time for Christmas! Happy Shopping and Holidays!